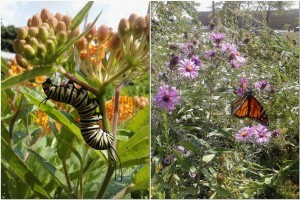 Zipping and fluttering in the air against a backdrop of wildflowers, hummingbirds and dozens of species of dragonflies and butterflies have come to inhabit the native prairie rain garden at the Mennonite Church of Normal. 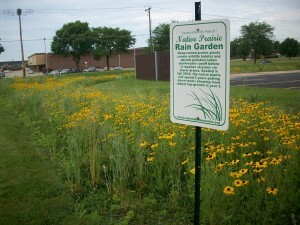 An existing 1700 sq ft turf drainage swale adjacent to the church parking lot was converted to a rain garden in order to increase landscape biodiversity, enhance the swale’s ability to filter stormwater runoff and to promote curiosity and wonderment in children of the congregation and the surrounding neighborhood. The project began in 2010 with removal of existing sod followed by cultivation of weeds throughout the summer. A highly-diverse seed mix of more than 100 species of prairie grass and wildflowers was sown on the soil surface in early winter among an existing cover crop. This ‘frost-sowing’ technique allowed for the freezing and thawing of winter soil to naturally settle the seeds to soil depths optimal for germination. 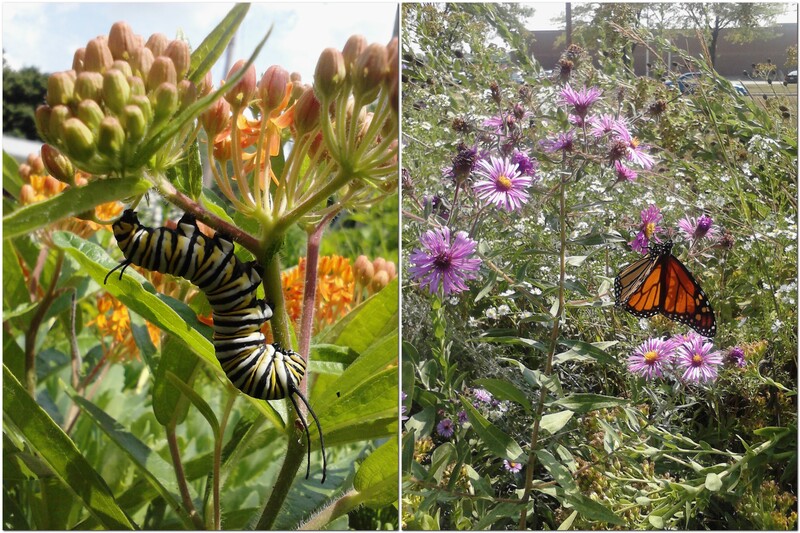 With a grant from the IL Native Plant Society, 450 mature plant-plugs of thirteen different species were installed this summer. The rain garden will serve as a butterfly habitat and life-cycle study area for the children of Normal’s only Head Start classroom, hosted by the church in its building. Considered a demonstration garden, the church provides interpretive signage and materials and welcomes visitors for tours. have historically held to the notion from the biblical Psalms that the earth and everything in it belongs to God. The confessional document of the Mennonite Church USA denomination names Christians as “stewards of God’s earth” and teaches that Christians are “called to care for the earth and to bring rest and renewal to the land and everything that lives on it.” Many historic Mennonite communities in Europe and Russia were known for their innovative agricultural practices and large-scale conservation initiatives. While rainwater is natural, storm water is unnatural and polluted. One of our goals for the rain garden is to increase the ability of the swale to retain and filter stormwater through the use of deep-rooted, perennial plants. Low-diversity landscaping does little to support natural systems. 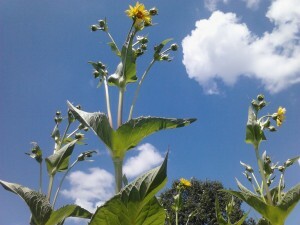 Another goal of the rain garden is to increase biodiversity on the church property for both beauty and wildlife value. We also hope to promote wonderment through engaging green space for congregational children, the onsite Head Start classroom and families living nearby.